After the 2015 match, Don Lothario was dumped by Cassandra Goth for his womanizing antics during the match. Dina Caliente successfully married Mortimer Goth, but soon found herself single again, after the Goth patriarch did not believe that her newborn alien boy could possibly be his child. Fortunately, Nina was willing to take her sister back, and help her raise the baby, whom they named “Juan”. [Watch this Video: Dina Caliente’s Baby – Who’s the Father?] for the full story. Don was frequently away from Pleasantview for humanitarian work as a doctor. But whenever he came back to Pleasantview, he made time to visit the Caliente sisters and spend quality time with Juan. Dina is grateful that Don would offer to be a father-figure to her son. Both Nina and Dina suspect that Don may indeed be Juan’s father, but they never bothered to confirm this. In fact, the Caliente sisters taught Juan to be grateful to have 3 adults to care for him, even if “none of them are the marrying type”. 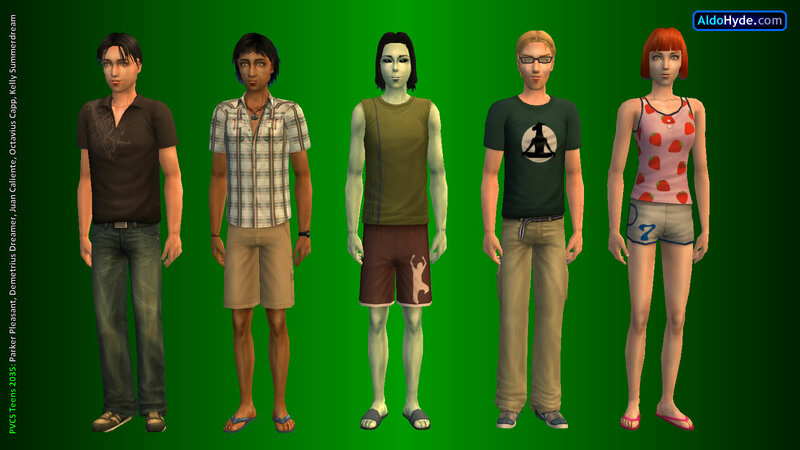 Juan was bullied by the townie teens at school because of his green skin. So he enters the match angry. Juan tends to be sloppy on and off the pitch, and was chosen to start the match only because the other goalkeeper was ill that morning. The STM players will be curious about Juan’s heritage. 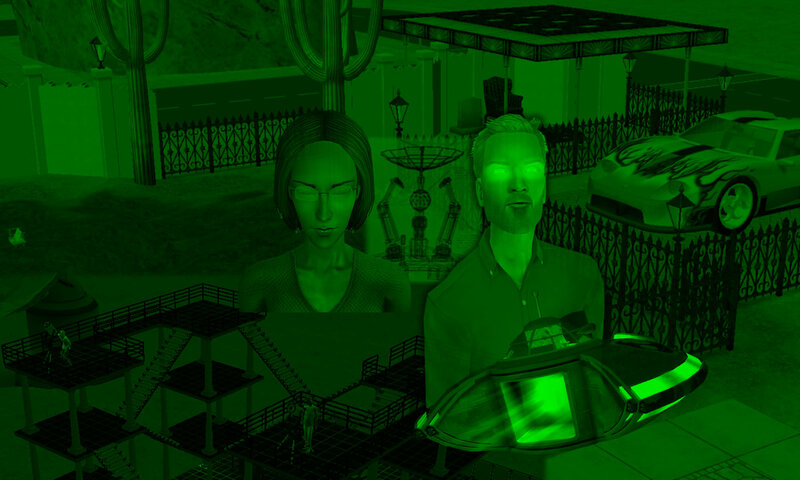 As far as Juan and Dina know, the green complexion is a result of Dina’s alien ancestors. On the day of the match, the Caliente sisters conveniently couldn’t take the day off, since they are not interested in football. So Uncle Don took Juan to the match. Darren Dreamer’s attempts to court Cassandra Goth eventually didn’t work out. Darren lives alone in the original Dreamer house, where remains with his wife’s grave, and continues painting at his own pace. Dirk Dreamer became a businessman, and pays for all the bills his dad needs to pay. He married Angela Pleasant, and had a son named Demetrius. The three of them live a comfortable life in the huge mansion, 113 Wright Way. 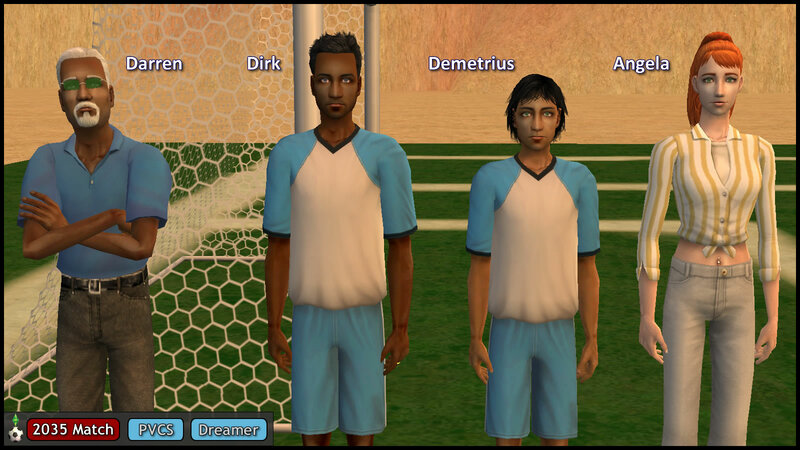 Young Demetrius is an average teen off the pitch, but is fast and strong on the pitch. He really wants to win this match to make his Dad proud. So far, Dirk was never proud of him for anything, so Demetrius wants to prove his worth. Mom Angela is still not interested in football, but both his grandpas are there to cheer him on: Darren in the audience and Daniel on the PVCS bench. Brandi Broke had a hard life raising three sons on her own. Though she isn’t rich in her old age, she’s happy that her sons have made the best of the troubles they had in life. Though football isn’t her cup of tea, she is in the audience to support all her sons. Skip Jr is a nice guy. He is very good at football, because he grew up in a poor area, and had to play football for a living. Skip Jr is currently the regular starting goalkeeper for FC Simley Town (an amateur football club stuck in non-prestigious division leagues, coached by Daniel Pleasant), but is on the bench today because of a bad cold this morning. 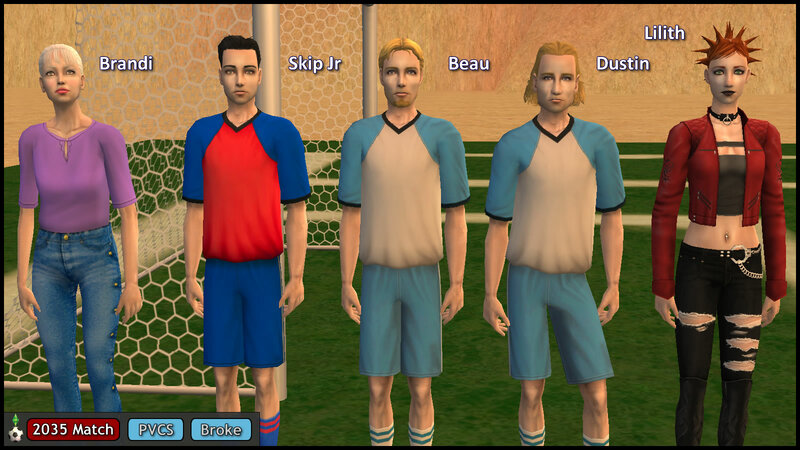 Beau also works as an amateur footballer in FC Simley Town, and is a good team player. Off the pitch, Beau is actually a wannabe-scientist. Unfortunately, he could never attend college because his family is too poor. He currently has a relationship with Lucy Burb, but he hopes SHE gets scouted for a big club like FC Simçalona or Simmerpool FC, so he can get some money from her transfer fee. Beau will gladly take her surname if Lucy becomes a pro footballer… heck, he’ll gladly take her surname if she can make him rich in any other way too! Dustin gave up his Criminal career after being in prison for 2 months. He promised his mother and late father that he would do something with his life. He tried joining FC Simley Town as a footballer, but was rejected. The official reasons are his criminal record and personality disorder, but the real reason is the head coach Daniel Pleasant’s personal dislike of him. Despite that, Dustin married Daniel’s less-liked daughter, Lilith, who is an unconventional, non-traditional woman. Lilith works in the Music career track, where she plays Heavy Metal bass guitar in a band. Dustin’s musical aptitude isn’t as good, so he became an employee in a music sales website, where he helps to promote Lilith’s band. Jennifer and John are satisfied with their performance in the 2015 match. This event inspired their then-underage daughter to consider an athletic career. Lucy Burb, who thinks of herself as “LB7”, is now an amateur footballer in FC Simley Town, coached by her Uncle Daniel. She had been in Simley Town for all her career, as if that isn’t enough of a reality check. Daniel Pleasant was caught cheating with the maid, Kaylynn Langerak, so his marriage with Mary-Sue ended in divorce. Kaylynn was pregnant with Daniel’s child, so they got married. But before that, Daniel changed his aspiration to Popularity, to safeguard himself from making the same mistake when he was married to Mary-Sue. Daniel was pleased to finally have a son, when he was close to becoming an Elder. Despite being close to the end of his Elder stage, Daniel Pleasant has yet to retire from his managerial role in the football club Simley Town, which he has held even before the 2015 Match. Simley Town FC is not extremely prestigious, being stuck in the third-fourth division leagues most of the time. So Daniel is a familiar authority figure to several PVCS players, and the top choice for Pleasantview PVCS Manager, as long as he’s still alive. Read Goals of Daniel Pleasant (GODP) for Daniel’s life story of family and football. Parker grew up well, and almost always got everything he wanted. He attended many Simley Town matches, and Parker learned how to dive when someone tackles him. After the Summerdreams’ not-so-discreet ball-bewitching plot was busted in the 2015 Match, the family is forced to reconsider their magical strategy. Hermia dumped Mercutio Monty, and married Puck instead. They live in the Summerdream house with Puck’s parents and their daughter, Kelly. Tybalt moved out of Capp Manor after his grandfather’s death. He lives alone in a small house on the Capp side of town, far away from the dividing river, where he entertains his delusions of being the “Capp patriarch” in a matrilineal family. Tybalt received money in Consort’s will, but his true inheritance is the role of the Feud mastermind. 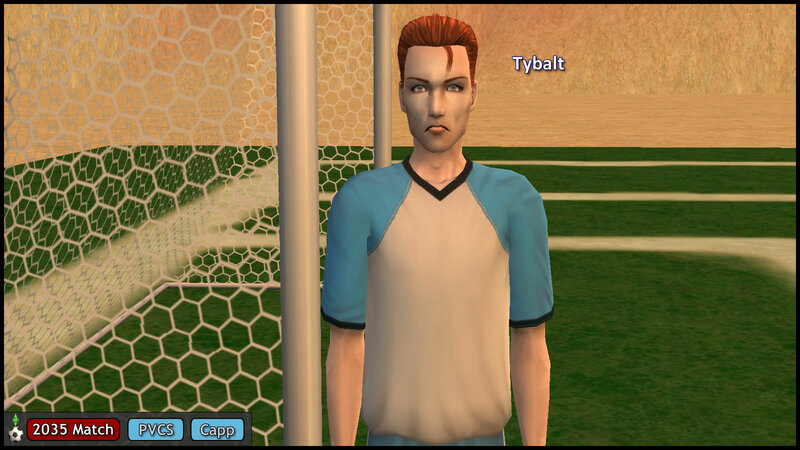 In fact, Tybalt is too busy plotting and fighting to find any love, callously ignoring all the sims who expressed any romantic interest. He and Mercutio Monty are the major reason why the Feud is still going on, since Pat and Consort are dead. Despite Uncle Kent becoming estranged from the Capp Family, and contemptuously referred to as “Kent Monty” by all the Capps, Hal Capp continues to treat Uncle Kent as his role model. When Tybalt tried to exploit Hal to bring about Kent’s downfall, Hal gave an outward show of halfheartedness, while inwardly rejecting the idea and its perpetrator. Goneril is displeased that Hal became a scientist, but has since gotten over it. She is relieved that Hal is playing for Team PVCS. Hal is proud and effective, both on and off the pitch. Ariel Capp is excellent in jumping and headers. She became a businesswoman, and is the favorite child of her mother. Despite this, she thinks her parents are too uptight, and tries not to get personally involved in the Feud. Regan‘s family lives in a comfortably-sized house on the Capp side, along the banks of the dividing river. After the 2015 match, Regan and Cornwall started their own small business, which is not officially affiliated with the main Capp enterprise. 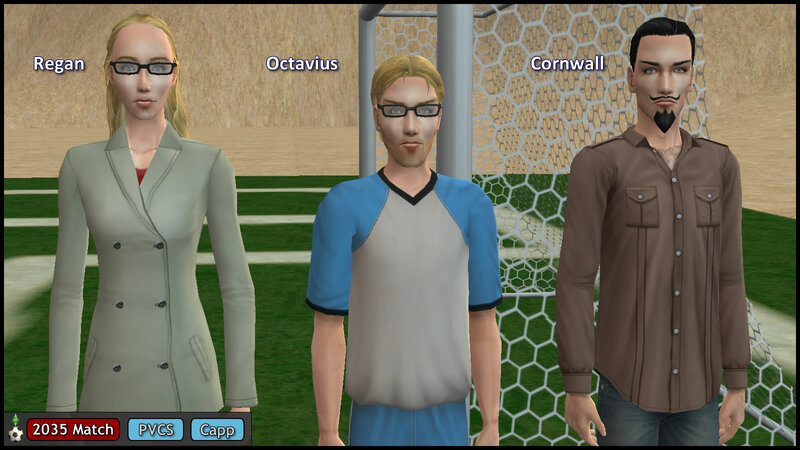 Octavius was born a few years later, and the couple groomed him to be THEIR heir, rather than the usual idea of a “Capp heir”. Some of the other Capps (in particular Consort, Goneril, Albany & Tybalt) sense that Regan seems to have lost interest in the Feud after the 2015 match, as she tends to bury herself in her work. Apparently, Cornwall is also too busy working to prod her back in “the right direction”. So if young Octavius is to learn to be a “true Capp”, he “should” be taught to see Tybalt as a role model. But half the time, Octavius wonders if the Feud is really any of his business, especially if nobody can give him a satisfying answer as to why the Feud even started. When Octavius isn’t studying or learning the ropes of his parents’ business, he is an avid gamer whose tag is “Octopus2018”. Regan is now the Veronaville PVCS Manager, due to her good performance in the 2015 match. Octavius is a proud player who can be trusted to deliver when it matters most. Cornwall is happy to support them both in the audience. I’m no sports fan, but this fanon is very entertaining! Nice job. It’s sad that Daniel and Mary-Sue broke up but everyone deserves to be happy, even if these means to cheat on your wife and sleep with a maid and leave your daughters for your mistress 😉. Where do Daniel, Kaylynn and Parker live? Daniel Pleasant’s new family lives in one of the similar condos as the Lothario / Caliente residences. At least he and the ST manager, General Buzz Grunt, have learnt from their previous mistakes — as Dan has stopped cheating, while Grunt behaves better towards aliens. The 2035 House pics are up – see the announcement on the AH Blog. Is Cassandra married? Pity she hasn’t married Darren but I think it’s better for Demetrius to have a biological grandfather rather than a step-grandmother and a biological grandfather. Also are Skip Jr. and Ariel Capp dating someone? Can’t wait for 2.06 (C)!! !